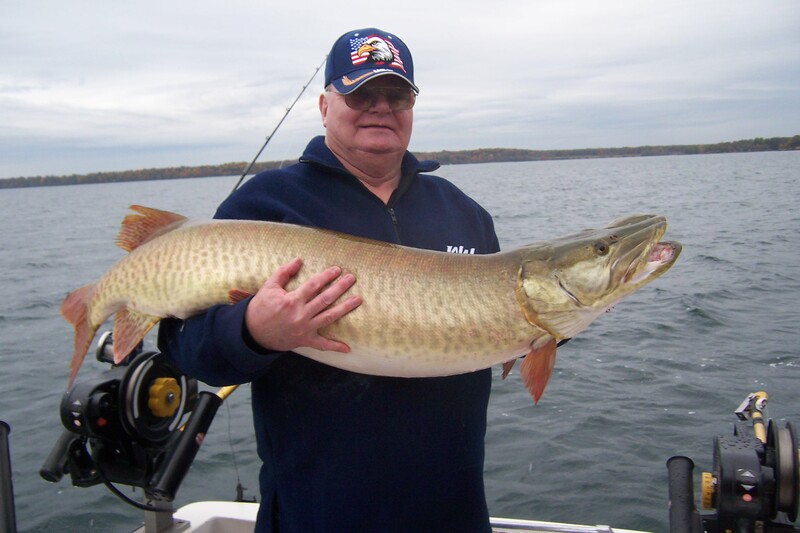 Trophy mystique lured Gary Decker to the St. Lawrence River and this trophy musky. of these incredible freshwater predators. He was excited, because when you play this game, in this kind of water, you just never know how big the next musky might be. It’s called trophy mystique, a feeling which lures thousands of anglers to Lake Ontario and the St. Lawrence River. stern. 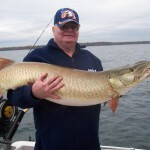 A few quick photos, “Ooohhs” and “Aaahhs” and the trophy musky was released unharmed to continue the mystique of musky fishing in the St. Lawrence. 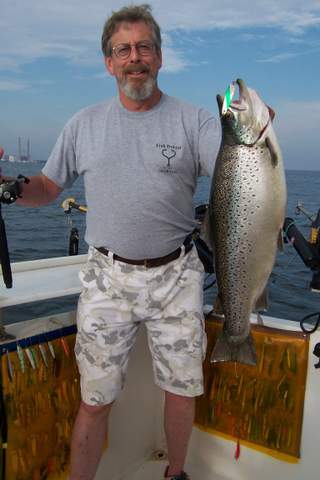 us who fish this unbelievable trophy producing water believe even larger steelhead are out there. There it is again…, trophy mystique. Over the years I have guided anglers on many waters in New York State, including 28 mile long Lake George, 130 mile long Lake Champlain, and the Finger Lakes. The fishing in these lakes was excellent and the scenery spectacular, but you pretty much knew the maximum size that îake trout, rainbows, and landlocked salmon could reach. Nice fish and trophies in their own right, but there were limits. Not so in Lake Ontario and the St. Lawrence River. Does anyone believe a landlocked salmon larger than the current 24.5 lb. New York State record won’t be caught? No way, that record will undoubtedly be broken soon, possibly in 2014, with the super abundance of forage available the past few years! How about the 47 lb. 13oz. chinook salmon record? Ditto! And, how about that 69 lb. 15 oz. state record musky Art Lawton caught in the St.
Lawrence River in 1957. There is a bigger one out there, and Gary Decker and I have a feeling in our bones that with the next smashing musky strike, we might just be tangling with it! This hefty Lake Ontario brown hit a 44 Sutton with blue lazer tape. If I had only one spoon to use for trout and salmon anywhere on a flatline, leadcore or copper line, or a downrigger or Dipsy, , it would be an ultralight flutter spoon called a Sutton, in Size #44. If I could select a few different sizes of Suttons, I would add the #31, #71, #88 and #38. The first time I fished LakeOntario in September, 1977, with my fishing partner Mac Collins, five out of the six kings my partner and I caught were on a flat silver #88 Sutton. Since then, Sutton spoons in a variety of sizes and stock finishes, plus customized versions I concoct myself, have caught every species of trout and salmon in LakeOntario for me including, cohos, steelhead, lake trout, domestic rainbow trout, landlocked salmon, several thousand brown trout, plus walleyes and bass. Suttons, by far, were the most popular trolling spoon for trout and salmon in New York’s Finger Lakes, where they originated many years ago, and continue to be manufactured in Naples, at the south end of Canandaigua Lake. They have one of the finest silver plated finishes on the market. Suttons are no longer available retail, but if you can find any used ones, call me! They were available in both ultralight flutterspoons and heavier casting spoons in a variety of finishes including flat and hammered silver, brass, copper, silver/brass, and silver/copper depending on the model and size. My favorite is the ultralight flutterspoon because it can be tweaked to troll properly at speeds from 1.5 – 3.0 mph. These spoons come from the factory with a light treble hook which produces good action at slow speeds. For my purposes on LakeOntario, I replace the treble on all Sutton spoons with a single Mustad siwash hook. On my favorite, the 3” long #44 Sutton, I use a Size #1, #1/0 or #2/0 Siwash hook depending on the speed I’ll be trolling for different species and the spoon action I’m trying to achieve. With the factory bend and a single # 1 hook, the #44 rigged with a #1 crosslock snap on a light leader will start to spin at 2.0 mph. Small crosslock snaps improve the action of any flutterspoon at slow speeds. Rigged with the same small crosslock snap, but a 1/0 Siwash hook, the #44 will start to spin at 2.3 mph. Rig a #44 Sutton with a #2/0 Siwash hook and a #2 Sampo coastlock ball bearing snap swivel it will wobble up to about 2.7 mph. Flatten the spoon thru the middle and bend back a 3/8” length of the nose of the spoon, and it will wobble up to about 3.0 mph. For brown trout, tune a Sutton to wobble. King salmon prefer a spoon that wobbles, but will hit spinning spoons when they’re aggressively feeding. Domestic rainbows sometimes prefer a flutterspoon that spins. Vary the size of the Sutton you’re fishing from the smaller, 3” #44 and #31 to the larger #71 and #38 depending on the size of the bait fish trout and salmon are targeting. One of my my favorite Suttons in LakeOntario’s gin-clear water when it’s sunny is the stock hammered silver/brass finish. A 1/16” stripe of fluorescent orange paint along the silver edge of a hammered silver/brass Sutton produces more fish in colored water under sunny skies. A flat silver Sutton with a diagonal stripe of light blue lazer tape is one of my favorites for brown trout in clear water and moderate light. Your own custom touches of tape and paint are sometimes just what the doctor ordered. I’ll never forget that first LakeOntario trip with Mac Collins. As he removed a crumpled #88 Sutton from a big king’s toothy maw, I suggested the spoon was ready for the garbage heap. “No way,” Mac said. “This baby is just starting to get a little character!” Mac put another “peppermint twist” in the spoon, rigged it on a downrigger and promptly caught another king on it. I’ve heard of some obscene prices being paid for used Suttons online, but they are probably worth it.